Adsum opened a few months in the space at 5th & Bainbridge that formerly housed Coquette. Owner and Executive Chef, Matt Levin, has a resume that reads like a Who’s Who in fine dining. He spent time at Le Bec Fin, Brasserie Perrier and Lacroix, among others, refining his skill set in fine dining. 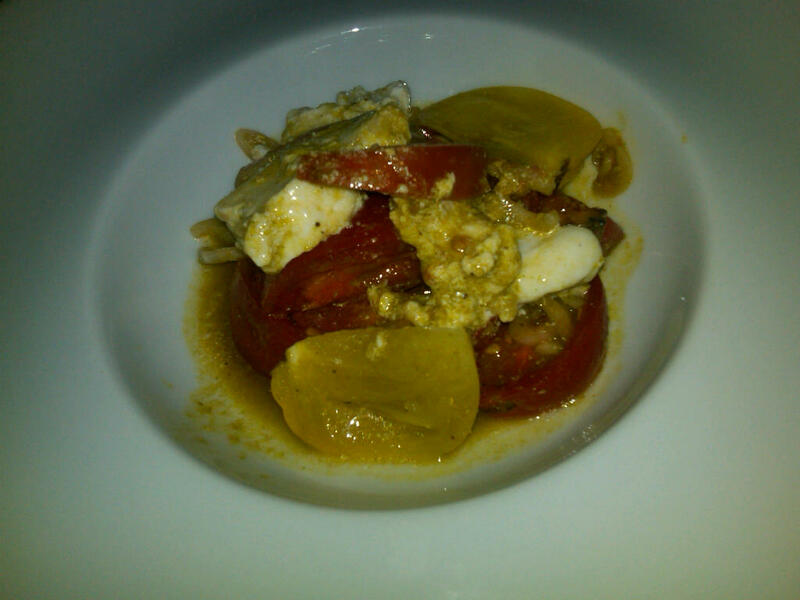 Adsum displays this attention to detail and fine dining with a little more personality. Chef Levin (@ChefLevin if you’re the Twitter-type) has taken Adsum and made it some weird yet phenomenal fusion of fine dining (and drinking, of course) and just plain fun! I asked my friends Joe and Christina to join us and we met them on a breezy Tuesday evening. I hopped out of the car while everyone was looking for parking and ordered a tasty Belvedere martini despite the intriguing cocktail menu. By the time everyone arrived, I had decided that I was not, in fact, going to order from the fixed menu, despite my initial attraction. 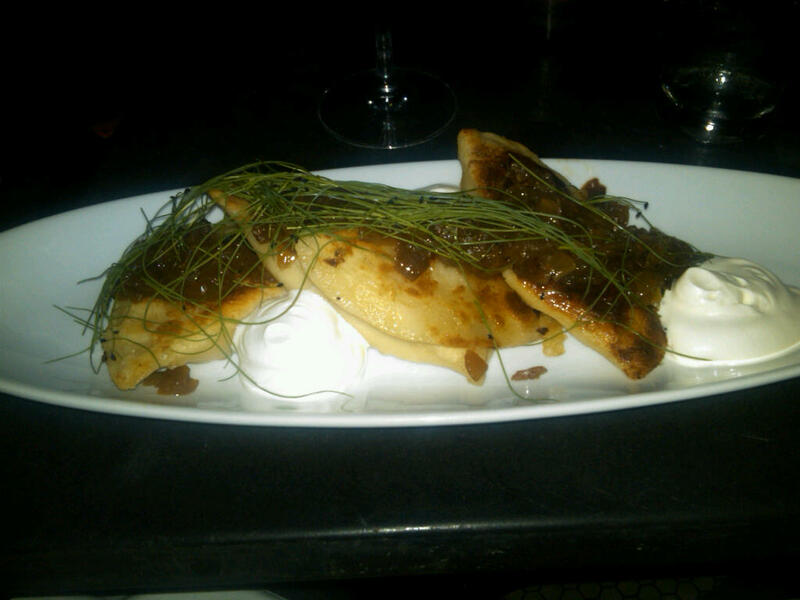 I was really, really drooling over two items on the menu–the pierogies and the fried chicken. Now, Rick Nichols LOVES Levin’s fried chicken, naming it the best in the city along with my neighbor, Ann Coll’s, at Meritage. Nichols must really like that chicken, because he was dining at Adsum the night I was there as well. As I was perusing the menu, I noticed that one of the waitstaff was a dear old friend of mine from high school. Along with an amazing meal that evening, I had the opportunity to catch up with Jay and feel blessed that we were able to reconnect. I asked Jay for suggestions and he immediately pointed out the fried oyster appetizer along with the fried chicken and pierogie entrees (how in the world do you spell pierogi? Spellcheck doesn’t seem to like any of my suggeestions.) Ironically, we had been checking out all of those dishes. 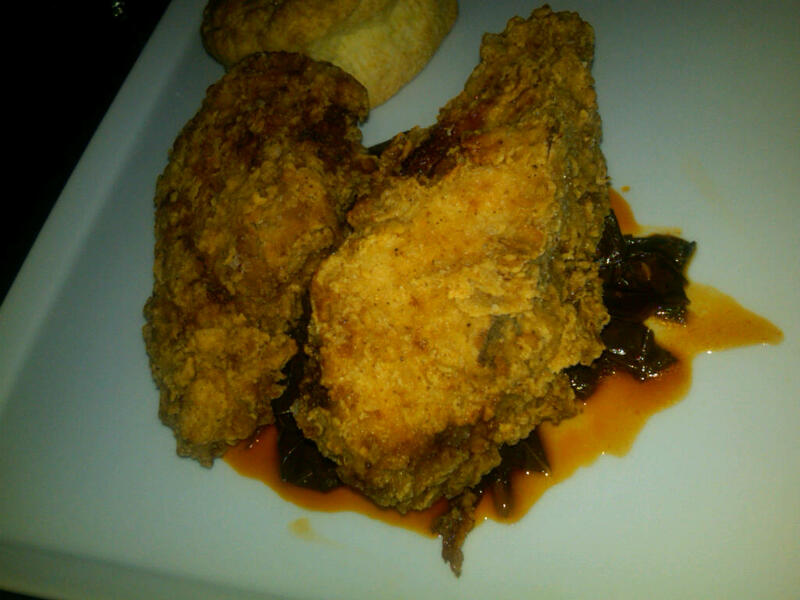 It was settled My husband started with the heirloom tomato salad (he’s a tomato junkie) and the fried chicken. I went with the fried oysters and pierogies. My husband loved his salad but I was too busy devouring my oysters to care about anything else. The oysters were fried with a pickle juice remoulade. Um, YUM! 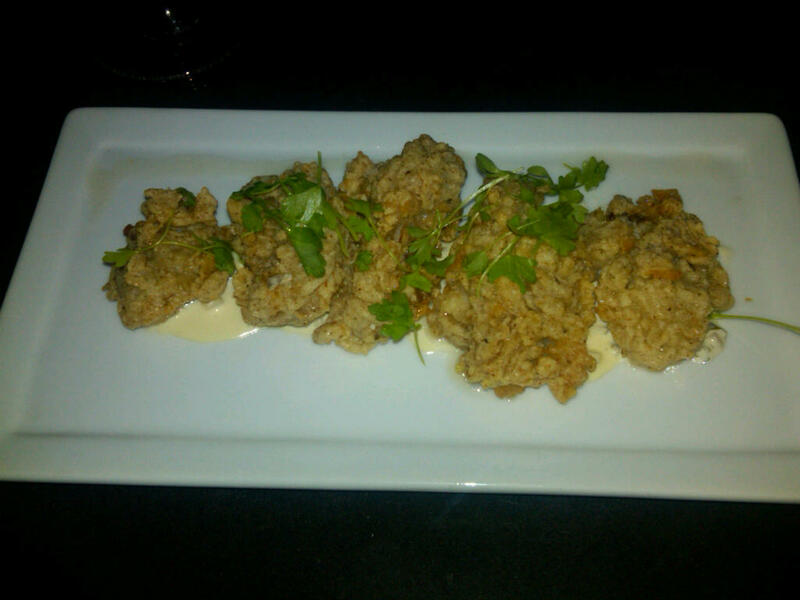 They were a perfect balance of crunchy fried coating encasing each meaty, briny oyster. Sigh. These were SO GOOD! Looking at that picture makes me want to eat them all over again. Christina ended up ordering the fixed menu and got the tuna carpaccio. I didn’t try any (or get a picture) but she really enjoyed it, especially commenting on the garlic soy flavor. In a funny twist of events, the kitchen accidentally had an extra romaine salad and dropped it at our table for Joe, who had not ordered an appetizer. Apparently Joe does not like green stuff, but the kitchen’s gift was not lost on the others. The rest of us picked at the romaine hearts while he snacked on a few of the polenta croutons. Then came the entrees. My pierogies, which Jay described as “not your grandma’s pierogies” were stuffed with a creamy potato filling and accompanied with”burnt onions” and a smoky buttermilk cream. Talk about comfort food. I can see why they make miniature versions of these for the late night bar snack. I loved the cool smokiness of the buttermilk cream while the onions rounded out the doughy pockets. One word of warning–if you don’t like smoke flavor, you will not like this dish. Luckily I like smoke flavor! Then came the fried chicken. Save yourself some bad writing and cut right to the chase with Rick Nichol’s description that I linked above. This chicken might have been the best thing I’ve ever eaten. Unfortunately, I took an awful picture. Oh well, go there yourself and just get the chicken. You’ll thank me later. I didn’t get a photo of Christina’s gnocchi, but Joe went all out and got the burger with farmhouse cheddar, pancetta-onion fondue and, yes, duck fat fries. 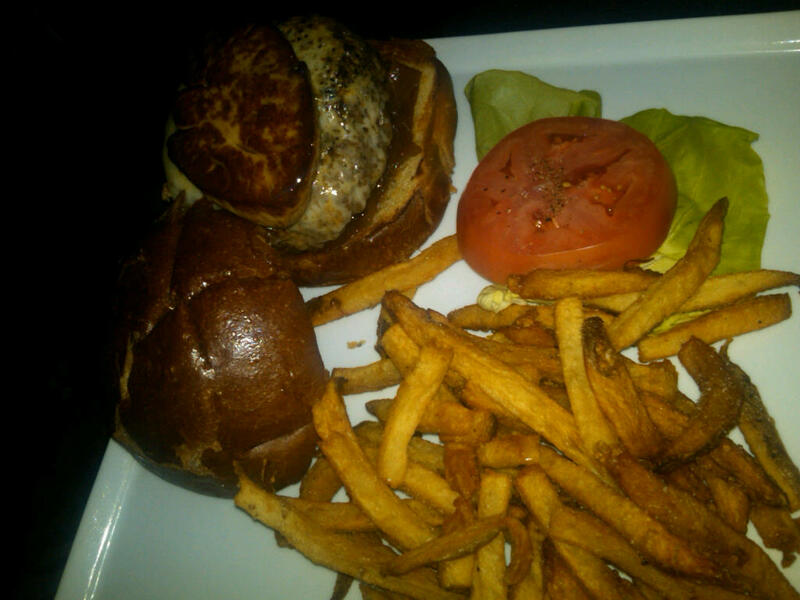 Oh right, I forgot the mention the monstrous SLAB of foie gras that can be added for an additional $9 (in case you were wondering, he doesn’t eat green stuff on his burgers either.) I didn’t try the burger, but Joe left a happy and full man. I did snag a few fries and they were perfectly crisp and salty. Much better than the super crisp yet tasteless fries I had in New England this weekend. Throughout the dinner we had a couple more drinks and lots of laughter (some of it coming at the expense of the person pouring our water who poured it really, really high such that we couldn’t pick up our glasses without spilling it all over. Things like this are amusing to me.) The wine comes in beakers and is poured into your glass table side–the wine pairing came with smaller pours which was probably a good thing for Christina! My husband and I ended dinner with after dinner drinks that they recommended. My mind is blanking right now but I definitely enjoyed it. Overall, Adsum has a great vibe. I would love to check it out for just a few apps and drinks and it would probably become dangerous to my wallet, liver and waistline if I lived a little closer. Oh, and we didn’t realize that we were on a pre-celebratory dinner with Christina and Joe who got engaged the next day. Congratulations, friends!